New York, NY (August 1, 2011) --- Native New Yorker, Eliza Callahan, has been announced the winner of the coveted “Song of the Year” from the 14th annual John Lennon Songwriting Contest for her original composition, “Bridge Song.” Eliza, will be awarded $20,000, in addition to a ton of other prizes she has already won! At age 3, Eliza began studying Suzuki classical guitar at The Third Street Music School Settlement in the East Village. She grew up listening to The Beatles, classic Rock and Roll, and Jazz. By age 7 she excitedly picked up the electric guitar, which she felt better fit her “electric” personality, and began writing quirky songs and melodies. 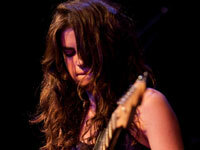 In 2008 Eliza enlisted two friends from middle school to come into Axis Sound Studio with her guitar teacher/producer, Jeff Peretz to record some of her songs. This project led to the formation of the band Almost Allison. They proceeded to play gigs around NYC and Brooklyn and although the group was young and short-lived they almost immediately received attention from producer Mark Ronson. In October of 2009 Ronson sent Eliza’s song “Tide Comes In” to Fader Magazine, whose review described her vocal style as having “a magic amount of control over her scratchy-sweet voice, particularly the little warble that turns up at the end of every phrase.” Later that fall Topshop listed Almost Allison on their Playlist alongside Passion Pit, Julian Cassablancas, and Vampire Weekend and used “Tide Comes In” as the backtrack for their Spring Summer 2010 Behind the Scene Fashion Campaign Video and later featured Almost Allison in Topshop Magazine as one of their “new favorite artists.” In the summer of 2010 Almost Allison split up and Eliza returned to the studio to continue recording her songs. A total of over $275,000 in cash and prizes will be distributed this year by the year-round contest open to both amateur and professional songwriters. Visit www.jlsc.com to listen to Eliza's winning song, download her photo and enter the current contest.